Butterfly collecting is more important than ever before. As a caretaker of one of the world’s largest collections of preserved butterflies and moths, and as a very active field researcher, I spend a lot of time explaining why we still need to collect specimens. All these cases of dead butterflies contribute greatly to our understanding of their still-living brothers and sisters. Collections are vitally important—not only for documenting biodiversity, but also for conservation. Museums are storehouses for information generated by everyone who studies the natural world. Natural history collections constitute the single largest source of information on Earth’s biological diversity. Most of what we know about what lives where and when is derived from museum collections, accumulated over the past 2½ centuries. Methods of field collecting have changed little since butterfly collecting became popular in Victorian times. The butterfly net remains the primary tool of the trade. Most butterflies are attracted to flowers, although bait traps—with fermenting fruit, putrid liquefied fish, mammal dung, or even carrion—are used to attract certain species. Upon arriving home, collected specimens are pinned, with a single pin through the body (thorax). We position the open wings on a flat board so they’ll remain in the spread position once the butterfly has dried. Then we stick a label to the pin, indicating exactly where the specimen was collected, when and by whom. 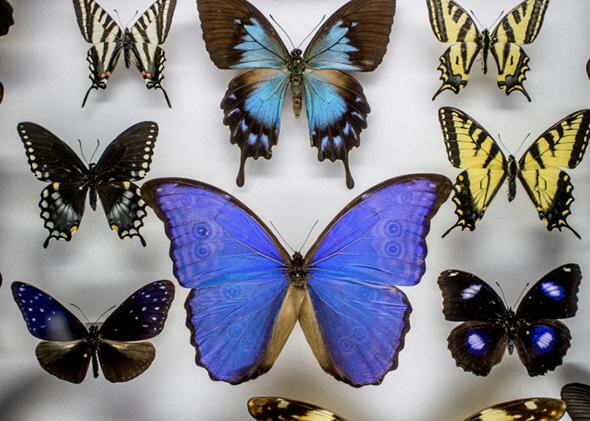 Dried specimens are extremely fragile and need to be protected from pests, light, and humidity; if this is done successfully, specimens may last indefinitely—the oldest known pinned butterfly specimen was collected in 1702. It’s these collected specimens that enable detailed studies of anatomy. These studies in turn contribute to taxonomy, the science of classification, which provides a basis for communication about organisms across all disciplines. As genetic technologies continue to advance, museum collections are increasingly important resources for DNA-based studies on taxonomy, climate change, and conservation genetics. Despite their status as most-favored insects, there are still many undiscovered, unnamed butterflies, all over the world. Every year, we discover new butterfly species. Just like flies, beetles, and wasps, a significant percentage of butterfly species remains to be formally identified, named, and classified. This is especially true in tropical areas around the world, where new butterfly species are discovered on a monthly or even weekly basis; eight new tropical butterfly species have already been named in 2015 in just one journal. Discoveries aren’t exclusively made in exotic, hard-to-reach locations, though. New species are frequently found within existing museum collections. When specimens are closely examined (or re-examined) by experts, it’s not unusual to find multiple species among what was previously considered just one. Such discoveries are made through traditional anatomical studies, as well as through newer DNA-based technologies, which can detect multiple species among specimens that appear, to our eyes, to be identical. Due to their population dynamics, with a single female often laying hundreds of eggs, collecting a few butterfly specimens, even in a small population, would be unlikely to have a detrimental effect. The only proven method for driving a butterfly to extinction is habitat destruction and fragmentation. Sadly, there are many examples of butterflies that have been exterminated in this manner—the most famous in the United States being the Xerces Blue. Now, these extinct species can only be seen and studied in one place—a museum collection.